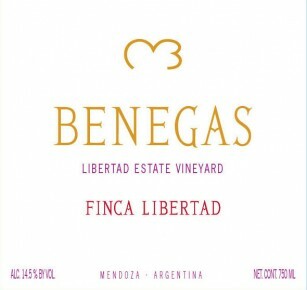 Grapes are sourced from estate-owned vineyard called Finca Libertad located in the Upper Mendoza River Banks, with some of the oldest vines in the area (the Cabernet Franc was planted in 1888, Cabernet Sauvignon was planted in 1927 and the Merlot was planted in 1962). Inspired by the great wines of Bordeaux, this blend of old-vine Cabernet Sauvignon, Cabernet Franc and Merlot (all in equal parts) displays delicate aromas, refinement and complexity, together with an optimum ripeness and elegance. A well balanced wine with good acidity, ripe tannins and lasting fruit aromas. Enjoy with a hearty meal of red meat, lamb and aged cheeses.